Although its name and most famous historic figure – Admiral Horatio Nelson who sits atop the 43.5m column – recall a pre-Victorian battle, Trafalgar Square was developed during Victoria’s reign. The Regency architect John Nash got the ball rolling in 1812 with his vision for a cultural space, “a new street from Charing Cross to Portland Place”, and the baton was taken up in 1838 by Sir Charles Barry, also responsible for the rebuilding of the Palace of Westminster, who presented a plan including the statue of Nelson and two fountains. The beating heart of the capital, where Londoners gather to celebrate everything from football victories to new year, Trafalgar Square is enveloped by beautiful buildings – most famously the National Gallery and National Portrait Gallery to the north, and the church of St Martin-in-the-Fields to the east. It’s also a mere hop, skip and a jump down the Mall to Buckingham Palace. Do pass through Admiralty Arch built in honour of Queen Victoria in 1910 by her son, King Edward VII. A symbol of Victorian ingenuity, Tower Bridge has overtaken London Bridge as the capital’s most famous river crossing. In the 1870s, a new bridge east of London Bridge was considered crucial for the city and the public competition to find the right design proceeded in 1876. The winner, Sir Horace Jones – also one of the competition’s judges – took his inspiration from designs he had seen on the Continent and his scheme for a “bascule” (French for seesaw) bridge comprised a roadway formed of two segments, which could be pulled up like a drawbridge, allowing ships to pass. The high-level walkway, meanwhile, would allow pedestrians to cross when the road was raised. Initially run by steam hydraulics, Tower Bridge is today powered by oil and electricity. It has witnessed much drama over the decades, surviving the Blitz, rogue aeroplanes swooping between its Gothic towers in 1912 and 1968, and a bus making a daring leap over a three-foot gap as the bridge opened after a negligent watchman failed to ring the warning bell in 1952. From the Gothic grandeur of Big Ben to the ingenuity of Tower Bridge, London’s Victorian monuments feature on postcards and calendars, are lit up on special occasions and revered as timeless symbols of the capital today, as well as representing its rich history. Victorian architecture looked backwards as well as forwards. The sumptuous detail of the Gothic Revival of the mid-1800s, as developed by architects such as Augustus Pugin, for example, was retrospective, evolving as a reaction against the simplicity and symmetry of the Palladianism favoured in the earlier decades of the century, which looked back even further in time to ancient Greece and Rome. Later in Victoria’s reign, as a result of new technology, iron and steel began to be incorporated as building components. One of the most famous examples was Joseph Paxton’s Crystal Palace, the iron and glass structure that originally stood in Hyde Park and was later relocated to south London. Encapsulating the sense of looking both to the future and the past, Tower Bridge, with its iron-and-steel structure so cutting edge at the time, was also designed to complement the historic fortress nearby and clad in Portland stone – a fitting mix of something old, something new. Every schoolchild knows Big Ben refers to the Great Bell in London’s most famous clock and yet we persist in calling the tower itself by that familiar moniker. A defining symbol of the capital, Big Ben was part of the huge rebuilding project that took place after the catastrophic fire of 1834 destroyed much of the Houses of Parliament. 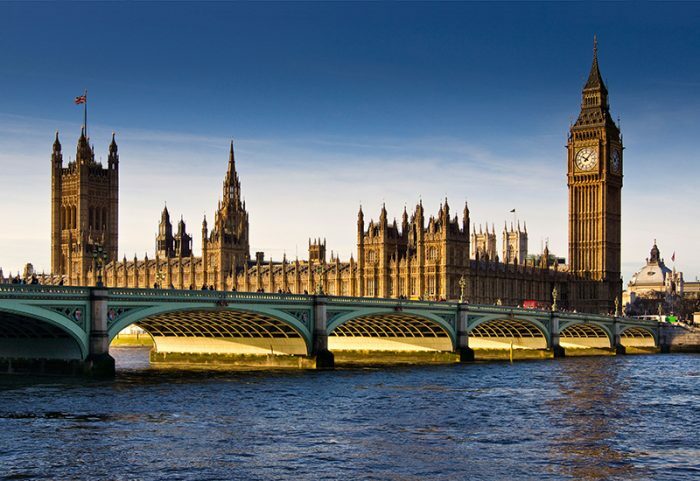 Big Ben is not the first of parliament’s clock towers (that was a monument known as Great Edward, and later Great Tom, which was built in 1288-90), but it has come to symbolise London – and even Britain. Big Ben’s chimes were first broadcast by the BBC on 31 December 1923, a tradition which endures to this day, and the clock has rarely stopped, even when a bomb destroyed the Commons chamber during the Second World War. After its medieval predecessor was dramatically engulfed by flames in 1834, heated discussions took place over the style of the new Palace of Westminster. Some favoured neoclassicism, as embodied by the White House in the US, but, as that style had associations with revolution and republicanism, the winning argument was made for a Gothic or Elizabethan building that would embody conservative values more fittingly. The winner of the 1835 competition to find a designer was well-known architect Charles Barry but, as his own style was classical, he enlisted the help of Bright Young Thing Augustus Welby Pugin, who, though the tender age of 23, had devoted himself to the pursuit of Gothic architecture. Paid just £400 by Barry for assisting him with drawings, Pugin, some say, deserves the lion’s share of credit, particularly in the detail of his work: most of the palace’s sumptuous Gothic interiors are his down to doorknobs and spilltrays. Certainly the enormity of the project did neither man’s health any good: the new palace wasn’t completed until 1870 by which time Barry had died, with his son Edward taking over, and Pugin had been committed to Bedlam, breathing his last soon after in 1852. There’s a tragic story behind the iconic red-brick building standing proudly in the heart of South Kensington. Originally called the Central Hall, the project was started by Prince Albert with the profits of the Great Exhibition of 1851, which took place in Hyde Park, just opposite the site. But when the Prince Consort died of typhoid in 1861, building was suspended until Albert’s collaborator on the Great Exhibition, Henry Cole, took the helm and work began again in 1867. Inspired by Roman amphitheatres, the elliptical hall, capped by a glazed dome, is built from over six million red bricks and 80,000 blocks of terracotta, and features a frieze in mosaic that spans the entire 244-metre circumference and portrays various countries bringing their offerings to the Great Exhibition. An emotional Queen Victoria opened the building, renamed the Royal Albert Hall of Arts and Sciences, on 29 March 1871. The Prince of Wales spoke on behalf of his mother, whose only recorded comment was that the hall reminded her of the British constitution.